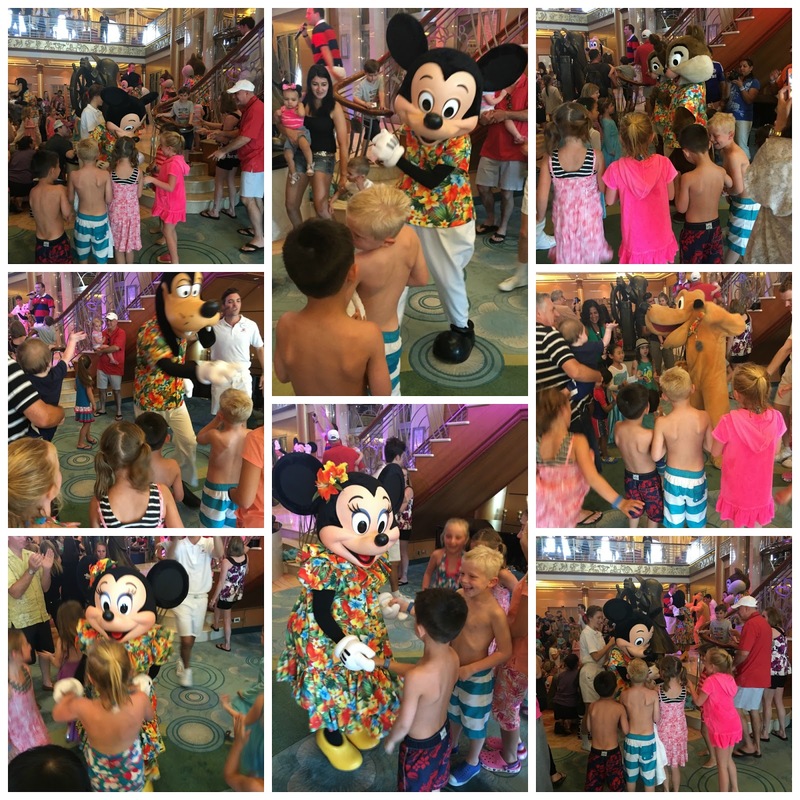 We were aboard the Disney Magic on a Four-Night Bahama Cruise (with our friends, the Shulls) so our last night came too soon! WAAAHHH!! However, it ended up being the perfect getaway. We had all weekend long to recoop (and get caught back up on the laundry situation). Our final day was a day spent at sea traveling back to Florida. We had BIG plans and appointments scheduled. First one...MEETING some PRINCESSES!! Oops! I caught Smith looking happy to see them. ha! Let's all take a minute and look at Ashby's pose. That girl worked her for the full four nights. The princesses were all so sweet and they all talked in the highest voice. Nixon looks as though he's almost over it. haha! 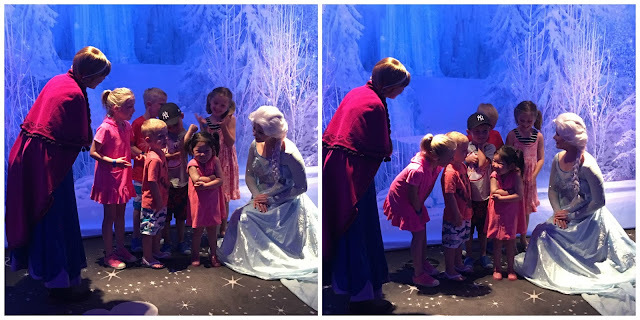 We had a bit of time before we had reservations to meet the Frozen characters so we let the kids go shopping. We'd been promising souvenirs on the last day of the trip and Mrs. Shay had promised some special prizes for some random things...most well-behaved and I can't even remember the other one. Mrs. Shay had promised there would not be a big six-way tie. But she never said there couldn't be two three-way ties. haha! Everyone got a special treat. Thank you, Mrs. Shay! The boys tied and so did the girls! Then it was FROZEN TIME! They had a dining room all set up like Arendelle. The sisters invited them up to the North Mountain to visit and I think at this point our kids were all so confused. hahahaha! I must note that right before the next character picture Bowen asked, "When can we go on a vacation without characters?". HA! He got lucky. With six kids, he never had to stand too close! We wrapped up our quick pics with Olaf and made a beeline for the POOL! My view on the last day...not too shabby, huh? The big kids were old enough to stay together and go ride the water slide and then come right back. They LOVED the little extra bit of freedom (and we did too)! We'd heard there was an Island Dance Party so we headed in just to check it out. It did NOT disappoint. Several characters were there and they switched locations so our kiddos got to dance with all them all! Remember back to the recent school dance? Nix is a little unsure what to do. In the middle of this dance party, I look over and Nix is trying to be funny. He just wanted to stop dancing. haha! After the dance party, the kids spent a little more time at the pool before going to kid's club for just about an hour before we had to start getting ready. We had an appointment at the Bibbidi Bobbidi Boutique! Every little girl's dream, right?! Ebby Lee was so excited about a new hair style, make-up, AND nail polish. the boys headed to the theater to watch the new movie, Zootopia. The theater was crazy crowded so apparently when you get really sleepy you lay yourself down on the ground for a nap. Slaughter Family on our last night. Our dinner the last night was delish! (and so were all the dinners) The last night the french onion soup was my favorite! The final show was titled, "Disney Dreams" and it highlighted a variety of Disney characters. Let me tell you....Ebby Lee was a BIG fan! Imagine just Ariel out on stage singing a song and then you hear ONE LITTLE CLAP. Wanna guess who that was? Ebby LEE!! She was so excited she couldn't control it apparently. hahaha! Words can't even express how much fun we had on this vacation! The cruise was fabulous, the ports couldn't have been more fun, the food was delicious, and we made memories with some besties that will last a lifetime. I could seriously go on and on!! AWESOME vacation!! The next morning we had breakfast and then went our separate ways because were were both going home different ways. We had a late flight out of Tampa, so we made the most of the extra time by stopping at Disney Springs (formerly Downtown Disney) for lunch and to see a few sights. We had a YUMMY lunch at T-Rex Cafe and took in ALL those dinosaurs! AAHH!!! Bowen was a BABY! Forgive me, I think I'm saying, "OOHH", because the dinosaurs were moving. We made the most of our couple hours in Disney Springs. Then we headed to Tampa. We stopped off at a park to see the beach, but I'm pretty sure this area was the setting of the last Dateline we watched so we didn't stay long. Totally kidding! These three were great little traveling companions! We bumped into a family friend at the airport. WHAT are the odds?? Mrs. Brenda was on our flight! The boys look pretty content on that flight home, huh? hahaha! Tab was so sweet and bumped Ebby Lee and I up to first class! WAHOO!! We lived it up and by lived it up I mean ate our weight in mixed nuts and warm chocolate chip cookies! And did I mention when we landed it was 9:45? We were exhausted and ready for our own beds! I'm telling you we had the BEST time and made memories for a lifetime! Don't forget to hop over to Shay's blog to check out her final day of paradise as well! And if you're thinking about a Disney World or Disney Cruise vacation, please contact us. We'd love to help plan your vacation! You can e-mail Shay at mixandmatchtravelagency@yahoo.com. Also, if you have any cruise-related questions I didn't address, please ask away and I'll make sure to answer. Happy Thursday! See you tomorrow for some Friday Favorites! Hi, my name is Shay and I don't mind bribing kids with treats for good behavior on vacations. Or lying to them about ties. :) We had the BEST time friend! I can't wait until our next vacation in 2017. And 2018. And 2019. And 2020. And for the next 50 years after that :). It was pure genius!!! We can't wait either!!! The sweaty dance party shots were hysterical! Your recap all week has been wonderful! Looked "magical". So, olé Walt's executives did their job! What a fun time!! I love it all!! I am so glad you girls and had such a fun time! Love you!! Goodness this looks like the best vacation! We have been talking about doing this for a while now, and I'm pretty sure you guys have convinced me!!! So glad it was fun! Ebby Lee's excitement and smile gets me!! What a fun trip!! I've loved reading all these posts and seeing how much fun you cuties had!!! What an amazing trip and memories for them! Sheaffer-it was crazy fun and HOT!! I hope we did Kara!! You guys will have a blast! Yes, Brooke!! You guys need to go again! Ebby Lee was so pumped. Chastity-it'll be worth the wait!! How did the crowds seem on the ship? We have never done a cruise before and are now seriously thinking about doing this for spring break next year. It seems like you all had a wonderful trip! I've really enjoyed following along on your vacation! Thank you for sharing, you've inspired me to book our own Disney vacation. 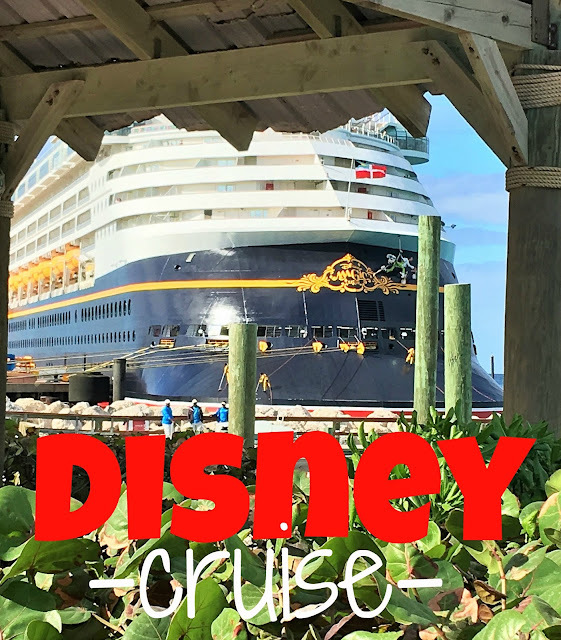 Do you know if it's cheaper to book a vacation on a Disney cruise or go to Disney World? What an incredible trip!!!! How fun! Bowen asleep on the floor during the movie is quite possibly my favorite picture from the whole trip! Any tips for first time cruisers... Going on the Disney Dream in July with my 10 year old daughter. What needs to be reserved ahead of time? The Disney Magic is one of the smaller ships so our crowds were not bad at all. I never felt like there were tons of people. I have never heard that being an issue on any Disney cruise though. Hi - would you mind sharing the type of tablet / bumper your boys are using on the plane? Ours had an unfortunate accident this week... Thanks! What shoes were the little boys wearing? I think I need those for my guys. Awesome trip. 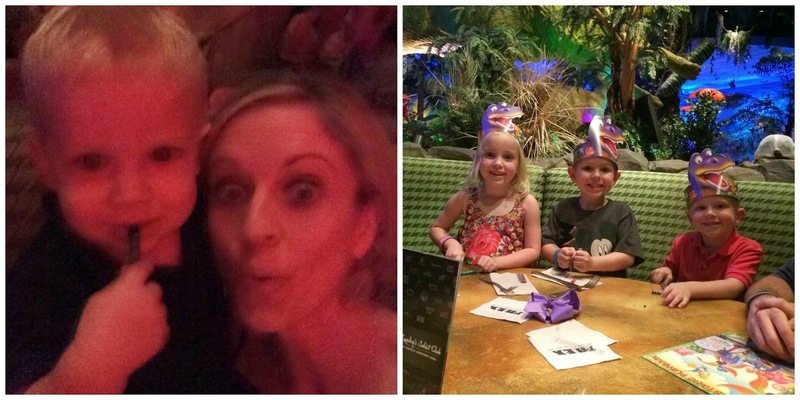 THANKS for sharing..
What do you think the best age is for kids on a trip like this? I currently have a 3.5 year old and 15 month old. I'm thinking at least 3 years old? Would you share a price point that these cruises cost and some tips (scheduling special visits, etc.) in a post? You might have answered this already... But did you feel like the 4 day cruise was long enough? If you did it again would you do a longer cruise? 4 days seems like it would go by so fast! What a fun trip! My only question is if anyone had issues with motion sickness on the ship? I have never been on a cruise and am thinking about it, but motion sometimes makes me dizzy! Obsessed. I'm sad these updates are over! I loved reading about your trip!!! And Ebby Lee with the solo clap for Ariel...bless! That made me smile. What a sweet little moment to have recorded and remembered for years to come!!! Hope and I have to bring our babies on the Disney cruise one day. For sure. My girls are 12 and 14 and huge Disney fans. They love the parks, but I would love a cruise! Are they too old for most of the activities? They would love to meet characters, but did you see any older kids doing that? It looks like so much fun!! Love these recaps!!! Thanks for sharing your vacation. you've convinced me that 1- we must take a Disney cruise 2- we might should wait for the boys to be 5+ years! The older crew sounded like the perfect age. Monak2-My 16 year old daughter loves the parks, but she equally loves the Disney cruises. I can't say enough about the teen club. It's fun, fabulous and totally age appropriate for teens. 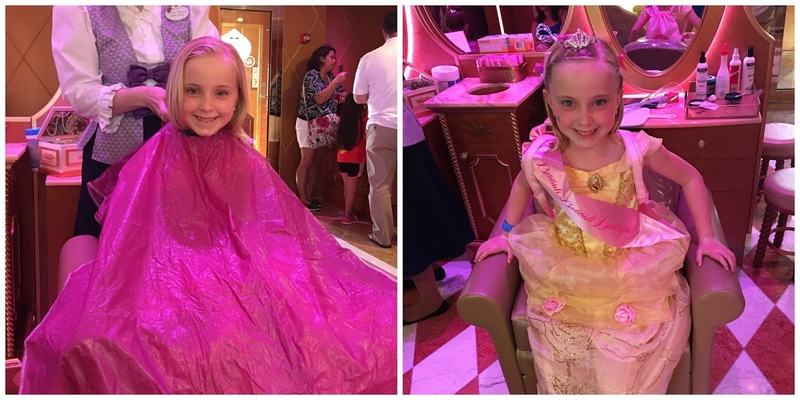 They'll love the disney cruise. Loved reading your recaps of your vacation. We are setting sail on the Dream this June and seeing reading your & Shay's blogs have me even more excited. My son will almost be 5 years old when we go and I cannot wait. This will be our son's first plane ride, any tips for the flight with an almost 5 year old? Also, obviously you took photos with your phone. Did you buy an international package or did you turn your email/texting off for your trip? Any other tips you can provide for on/off the ship would be great!